Welcome to the One Colorful Summer Blog Hop, sponsored by the Krazy Crafting Crew (KCC). The KCC is a group of mad-talented women who get together in a Hop format on the first Sunday of every month to show you projects with a new theme. COLOR and SUMMER are our themes this month. Here is the card I made for this Hop. First, I printed out the sweet scuba swimmer image (which comes with the fish and sentiment), which I purchased from Hambo Stamps. I printed it out on X-Press Paper and colored the images using Copic Markers. I cut the sentiment using a tag die plate by Sizzix and inked the edges using CTMH Exclusive Inks, in Sorbet; I tied a piece of twine from The Twinery. I fussy cut the scuba guy and the fish from the white background paper, and popped the guy up on an adhesive spring from CTMH. I used a piece of acetate for the scuba guy's mask for a little more realism. The tag is popped with foam dots. The background swirled glitter stock that's perfect for this image is from Robin's Nest, as are the Dew Drops I used to simulate bubbles. I decided the piece of cork paper simulated the sandy beach bottom, and its additional thickness is just perfect to hold up the easel card. The sender can use a Sharpie marker to sign the card right on the cork, or I think it would be clever to staple a Post-It Note to the corkboard with a sentiment, too. 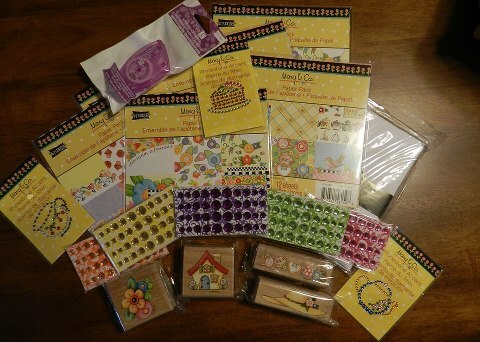 Yes ma'am -- I'd love to win this sweet packet myself, ♥ Mary Englebreit stuff!! Adorable, love the water drops. Cute sentiment. Love the card, the boy is way too cute! Precious card. Love how you put it all together. That cork paper and post it note inspires me! Thanks for sharing. So very clever, Ellen! Another good one! I <3 your adorable card and how you did both the water and the sandy bottom. 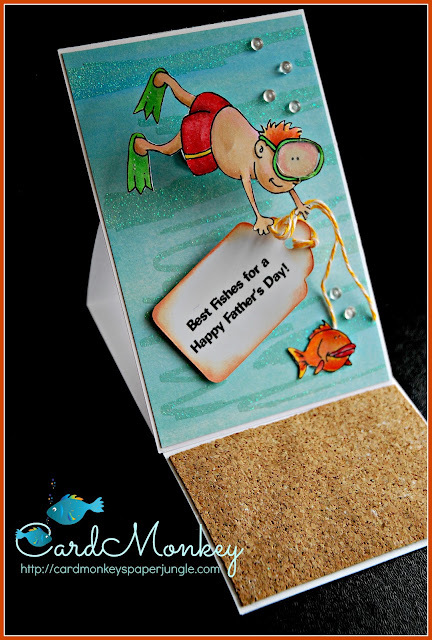 What a fun easel card. The cork paper was a great idea. Ellen, Ellen, Ellen, you always amaze me! I love your card! This card is terrific. Love it. TFS. Your card is ALL THAT! TFS! I'm off to do the hop. Incredible - so adorable and realistic! Just love your card! Great details on your card...love the sand and bubbles. I have to say you inspired me. I saw your card in the group on Facebook and thought I can't just throw some sloppy card together after seeing this so I got searching for digital stamps and ended up finding my watermelon girl which made me remember my watermelon box so i ended up not making a card but I did put some thought in my project so thank you very much. I love all the details Ellen, The cork paper is perfect! I'll have to remember that trick. I love your card!!! The cork paper is really cool standing in as sand. Thanks so much for sharing. Wow, this card is amazing and so darn cute! Love the cork paper and the fancy fold. This card is awesome. I love the cork paper that looks like sand. Wow. This is amazing. Your projects are always amazing to me. The color is wonderful!!! Great card! The cork was a perfect idea! And who doesn't love bubble bling? Your coloring is wonderful and I love the glitter swirls in the water. Fab job!